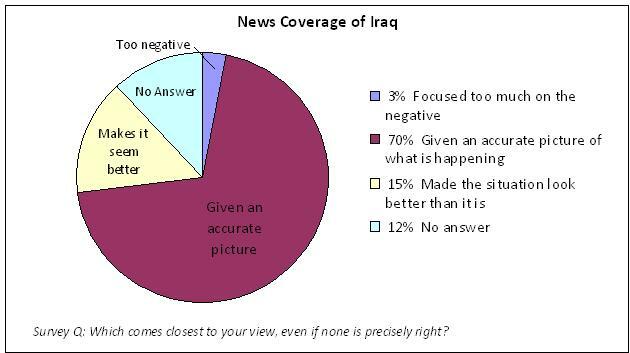 Finally, one question that has hovered over the coverage from the beginning of the war was whether journalists have been too negative in their assessments of the situation in Iraq. Early on, this was a common criticism among some in the Administration. Those criticisms have become less pronounced over time, but they have not disappeared. The journalists surveyed tend to disagree. Most (70%) of those surveyed believe their coverage overall has given an accurate picture of what is happening there. About one-in-six (15%) believe the coverage makes the situation look better than it is. Hardly any (3%) believe it focuses too much on the negative.